Solitary wasps are among the most easily observed of insects, and their behaviors and life histories are intensely captivating. 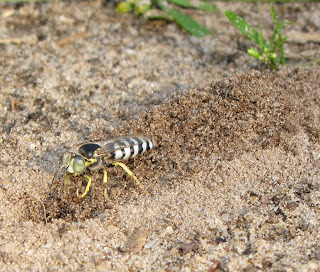 Sand wasps in the genus Bembix are familiar and common throughout North America, digging their burrows in dunes, on beaches, and other habitats with loose, deep sand. 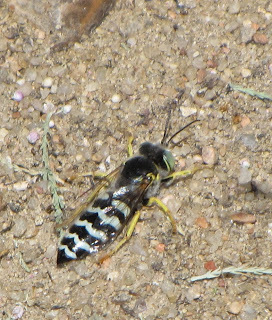 I had the good fortune of witnessing an industrious female sand wasp excavating her nest at Lathrop State Park in Huerfano County, Colorado last August 4, 2014. Insect activity was minimal in the late afternoon as the wind was picking up a bit and a thunderstorm was quickly approaching. While my wife was looking for a geocache, I studied the nearby vicinity and noticed a hole in the sand. Before I could complete the thought of "Hm-m-m, I wonder what dug that?," a sand wasp backed out of the cavity. The industriousness of a Bembix female is something to behold, as you can see in the video below. She rapidly kicks out large quantities of sand using a "tarsal rake" of spines on each front leg. There are twenty-one species of Bembix in North America north of Mexico, so generalizations about their behavior are risky. Still, the burrows are oblique, nearly horizontal in many cases, ranging from 19-57 centimeters in length, and a depth of 5-28 centimeters. The tunnels may curve, and usually end in a terminal cell. Several species also dig short, dead-end burrows or furrows in the immediate vicinity, probably to confuse parasites. The entrance of the real, finished burrow is thoroughly concealed. 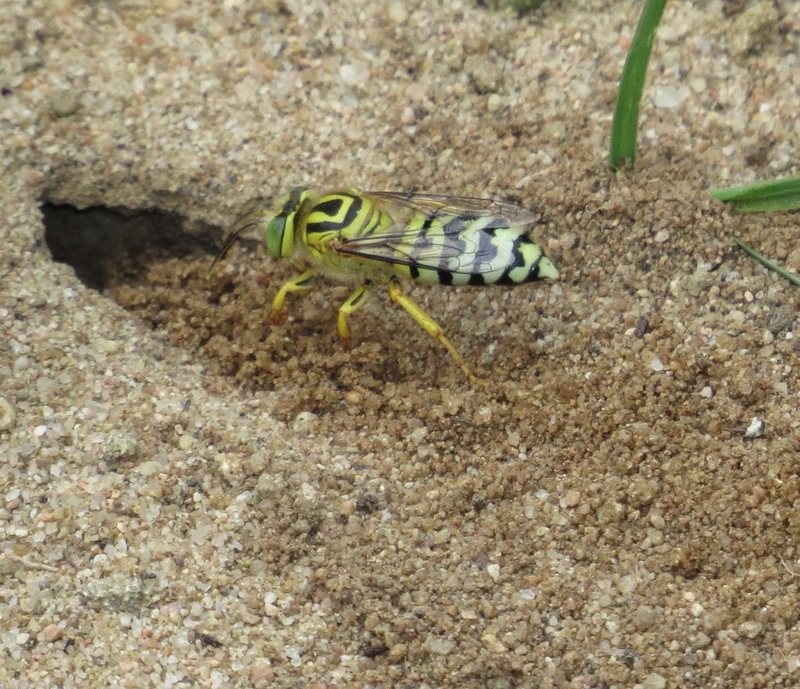 The burrow is excavated before the wasp goes hunting. True flies in the order Diptera, exclusive of the suborder Nematocera, are used as prey. Bembix are generalist, opportunistic hunters. 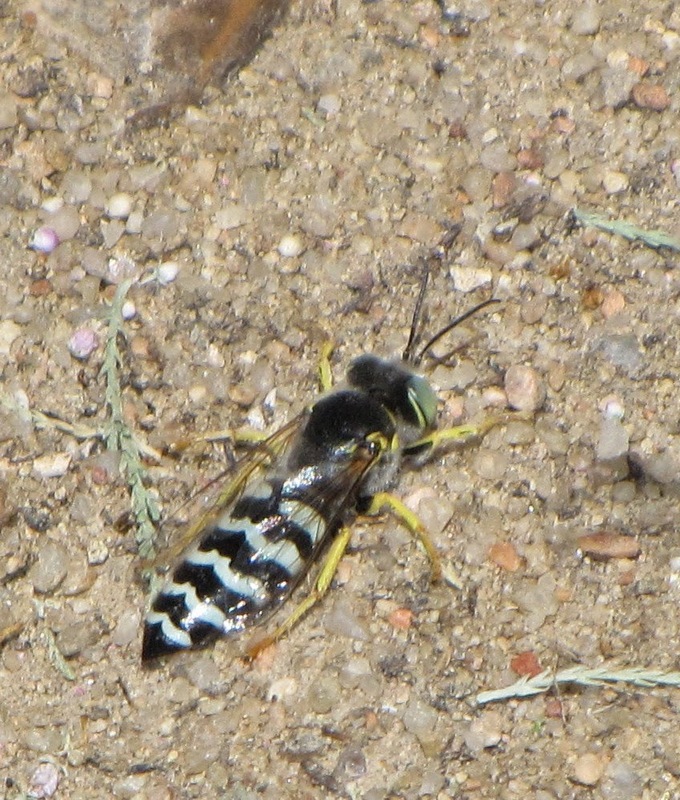 A victim is paralyzed or killed by the wasp's sting, and is then flown back to the nest. She uses subtle landmarks to unerringly find the buried entrance. Meanwhile, we can't remember where we parked our car. Most of our common Bembix species will lay an egg on this first victim, but some species lay an egg in the empty cell before commencing the hunt. Once the egg hatches, the mother wasp brings flies to her larva as needed. This is called "progressive provisioning" and is more typical of parental care in birds or mammals than in insects. When the larva reaches maturity, the female wasp closes the cell. Inside, the larva spins an oblong cocoon, weaving sand grains into the structure and resulting in a hardened capsule. Overwintering takes place as a prepupa inside this cocoon, but there are usually two generations annually. The mother sand wasp may fill in her burrow once her single larva reaches maturity, or she may construct one or two additional cells, each at the end of a short tunnel branching from the main burrow. 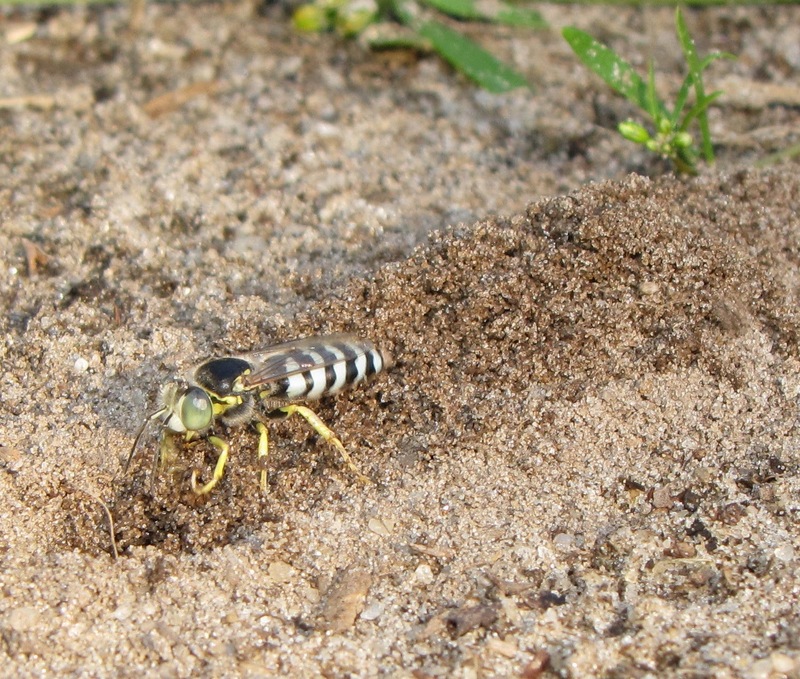 Male sand wasps are often seen alighting on the ground amid the numerous burrows of females, but they also participate in elaborate flight rituals called "sun dances." Males emerge before females, and fly at erratically at dizzying speed one or two inches above the ground attempting to detect virgin females about to erupt from their underground chambers. Females join the males in flight if they are not pounced on immediately, and a pair that unites in mid-air will make a bee-line out of the mob and finish mating elsewhere before re-joining the masses. Should a pair tumble to the earth, great numbers of males will try and usurp the initial suitor. Both sexes fuel their frenetic lifestyle with flower nectar, especially from composites (flowers in the aster family). 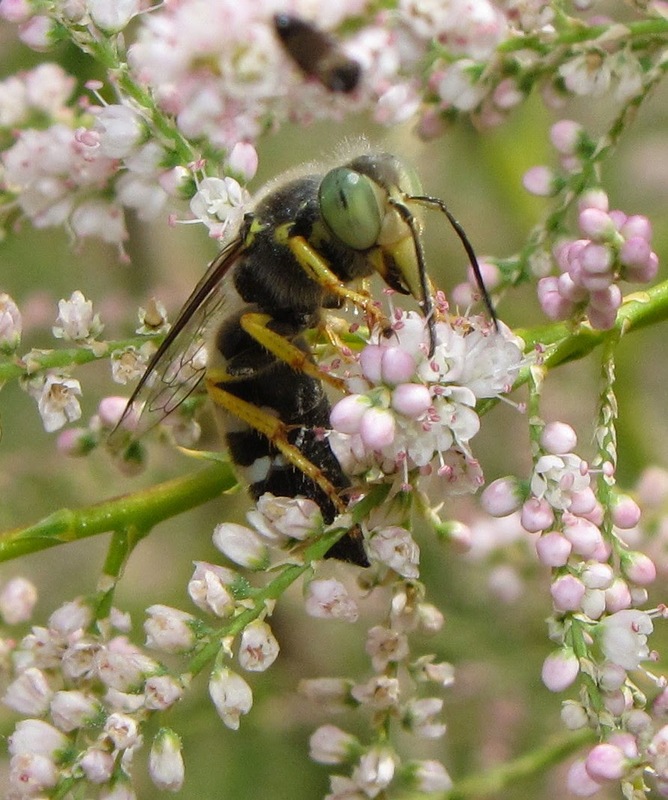 Some of their mouthparts are fused into a tongue-like proboscis they use to probe for nectar. Sand wasps do nothing slowly it would appear, and one barely gets a glimpse of them, even at a flower, before the wasp is off to another destination. 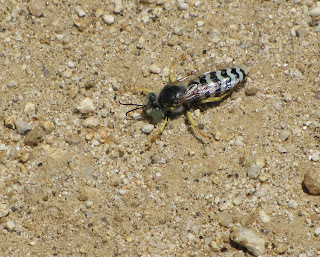 Bembix wasps are plagued by the usual suspects that parasitize wasp nests: Cuckoo wasps (Chrysididae), velvet ants (wasps in the family Mutillidae), satellite flies (Sarcophagidae), and bee flies (Bombyliidae) being the chief villains in the sand wasp world. Additionally, the adult wasps can be victimized by parasitic thick-headed flies (Conopidae), or killed outright by robber flies (Asilidae). Watching a nesting aggregation of sand wasps is never a disappointment, and at the very least you will find joy in each and every pesky fly they dispatch in providing for their larval offspring. Sources: Bohart, R.M. and A.S. Menke. 1976. Sphecid Wasps of the World. Berkeley: University of California Press. 695 pp. Evans, Howard E. 1966. 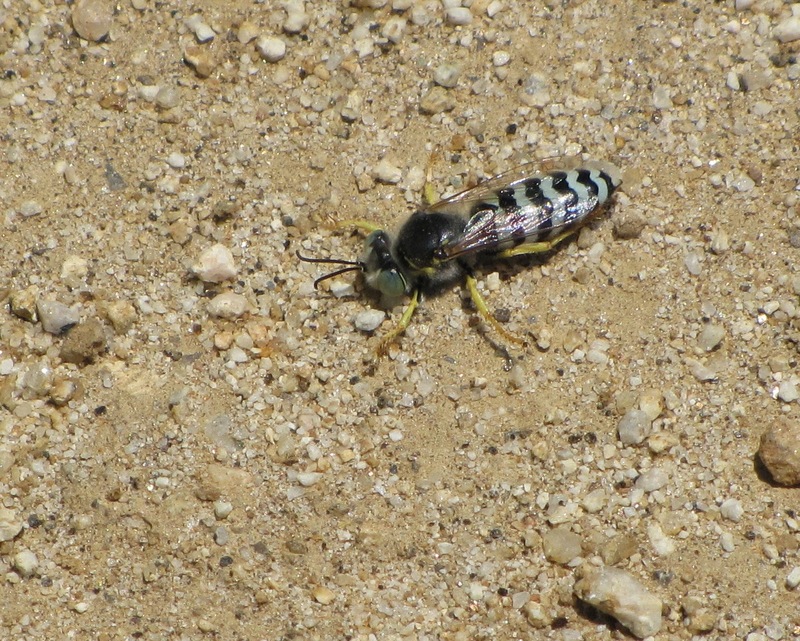 The Comparative Ethology and Evolution of the Sand Wasps. Cambridge, MA: Harvard University Press. 326 pp. Rau, Phil and Nellie. 1918. Wasp Studies Afield. Princeton, NJ: Princeton University Press. 372 pp. (Dover edition, 1970). 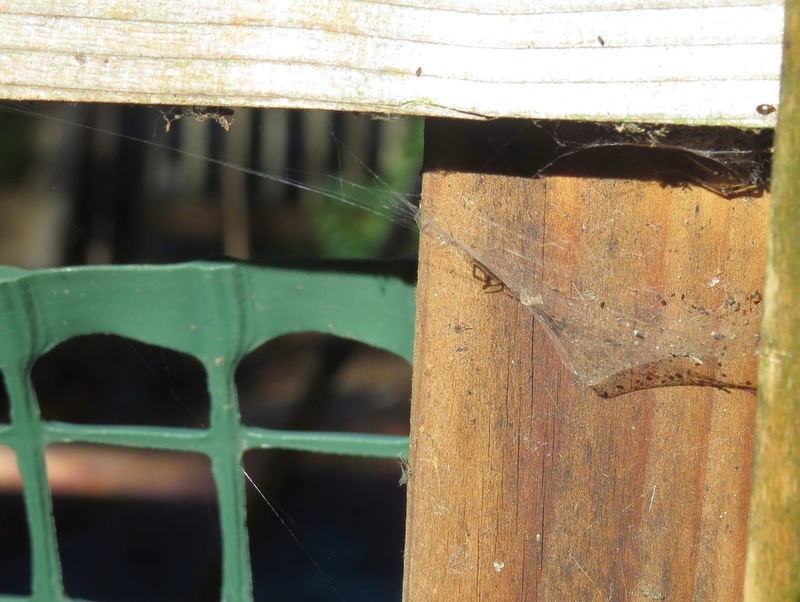 Many spiders simply cannot be found easily during the day. 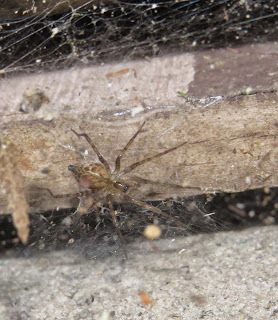 One case in point are what I am calling "basket-web weavers" in the genus Calymmaria, family Hahniidae. There is no official common name for either the genus or the family, despite the fact that these are common and diverse arachnids. 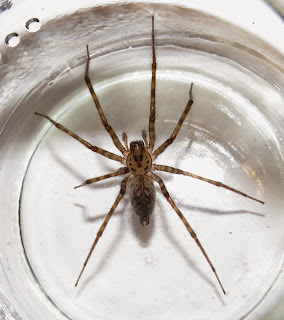 During my recent visit to Portland, Oregon in December and early January, I made a point to look for spiders around the apartment complex where my late mother had lived. I was not disappointed. 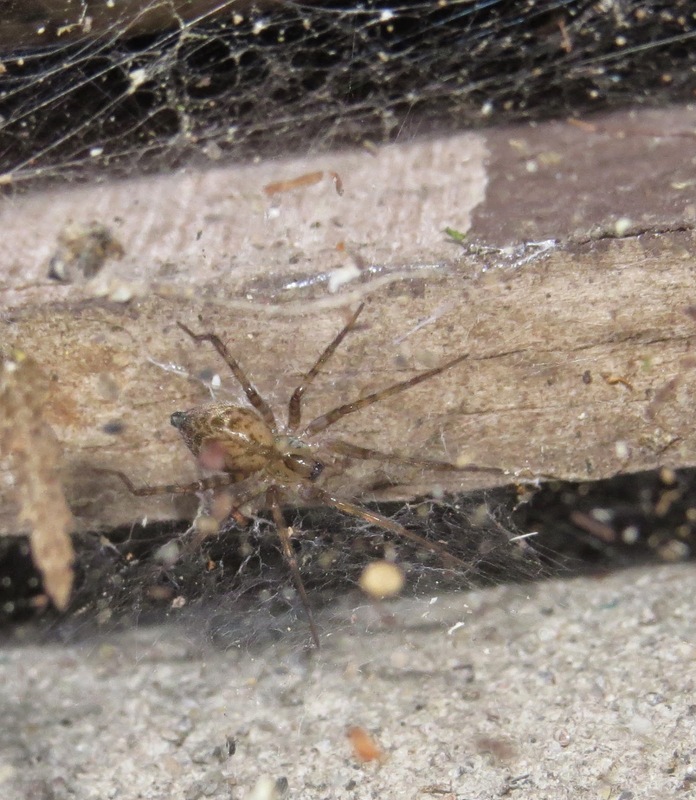 One of the most abundant spiders was some species of Calymmaria, though I was surprised by how many other spiders were still active in the relative cold, and certainly damp, weather that is characteristic of the Pacific Northwest at this time of year. There are 31 species of Calymmaria found north of Mexico, all but two of which are found along the Pacific coast, east to the Cascade Mountains (some species in the Sierra Nevada Mountains). Those other two species are confined to the Appalachian Mountains. The adults of Calymmaria measure 2-10 millimeters in body length depending on the species, and the ones I were finding were on the high end of that spectrum. In fact, at first I mistook them for members of the genus Tegenaria in the funnel-web weaver family Agelenidae. I learned while researching this post that indeed Calymmaria was once classified in the Agelenidae, and some species even placed in Tegenaria. The webs of these spiders are truly unique. The bulk of the web is an inverted cone, anchored to a substrate both above and below. 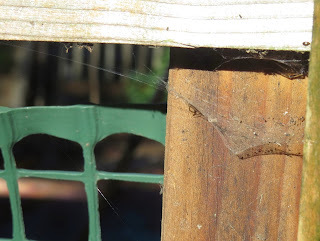 The spider also weaves a thin sheet close to the object from which the cone is suspended. 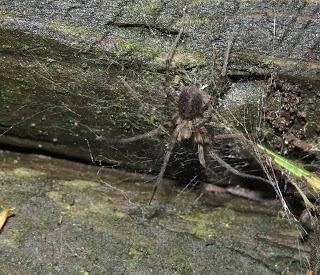 Typically, the snares are built under loose bark, or in furrows in bark, beneath moss on rocks or logs, amid rocks by streams, under cliff overhangs, the entrances of caves, or even on buildings, which is where I found the spiders imaged here. The spider emerges at night to hang beneath the sheet above the cone, though sometimes it may venture over the exterior of the cone. Prey is small insects, especially flies, which the spider attacks, bites, and retreats, maybe multiple times, before hauling the victim back to the platform web to feed. The species I found is very likely C. emertoni, but without collecting adults, especially males, and examining specimens under a microscope, I cannot be positive. Calymmaria bifurcata is essentially identical save for subtle differences in their genitalia. Females of bifurcata range from 5.89-8.25 mm, while emertoni is 5.02-7.95 mm. 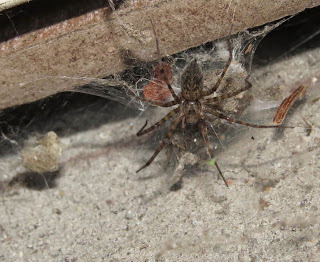 I grew up in Portland, in the very neighborhood I was visiting last month, but I never went prowling around at night, and therefore missed this particular spider altogether in my youth. Today, of course, I have to be cautious lest someone call the authorities for my suspicious behavior. I still recommend that naturalists be nocturnal as well as diurnal. I try and make myself more conspicuous at night, though, figuring that someone with criminal intentions will be more furtive. I'll let you know how that turns out. Sources: Adams, R.J. 2014. Field Guide to the Spiders of California and the Pacific Coast States. Berkeley: University of California Press. 303 pp. Heiss, John Stabe and Michael L. Draney. 2004. 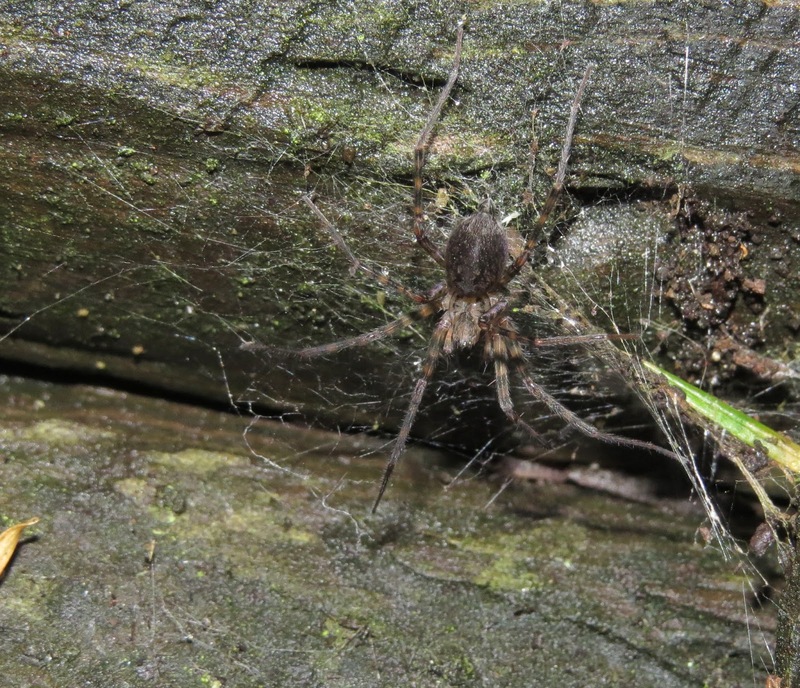 "Revision of the Nearctic Spider Genus Calymmaria (Araneae, Hahniidae)," J. Arachnol. 32: 457-525. Ubick, D., P. Paquin, P.E. Cushing, and V. Roth (eds.) 2005. Spiders of North America: an identification manual. American Arachnological Society. 377 pp. Few insects habitually appear in adult form during the winter months, but members of the family Trichoceridae, better known as "winter crane flies," are among them. I found a few attracted to the porch light at my late mother's apartment in Portland, Oregon the evening of December 10, 2014. Distinguishing winter crane flies from other crane flies is not easy, because the characters needed to tell them apart are not readily visible in the field, or even in images. 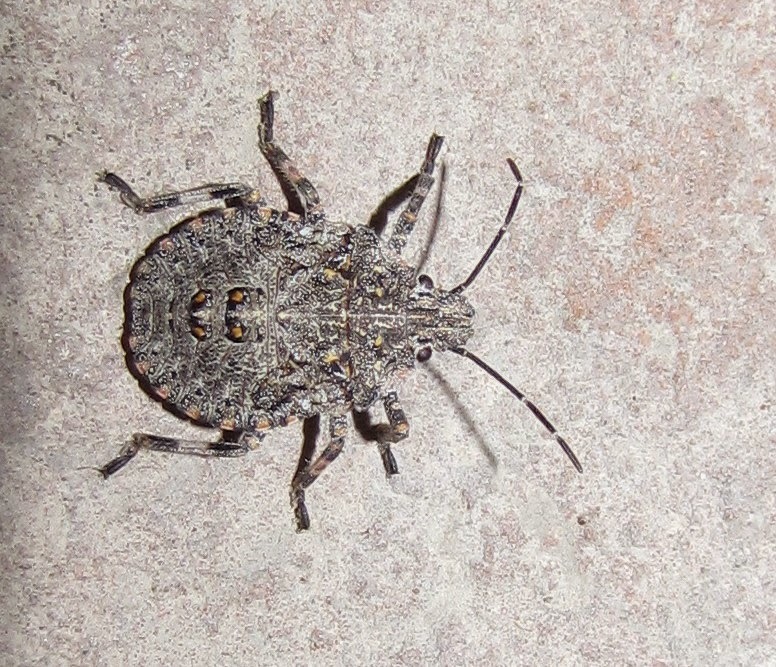 They are relatively small, averaging 6 millimeters in body length. 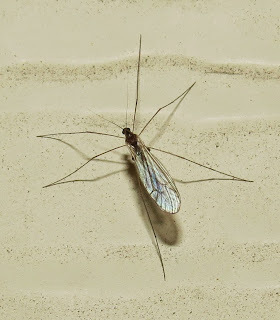 Winter crane flies have three "simple eyes," called ocelli, which other crane flies lack. The ocelli are on the crown of the head between the compound eyes. The wing venation helps to separate trichocerids from other families of crane flies, too; and even helps identify the three North American genera. Males can be seen flying in swarms on sunny days, but these flies seem to be associated mostly with dark, sheltered situations like the mouths of caves and mine shafts, hollow trees, and cellars. This might reflect the larval affinity for decaying organic matter. 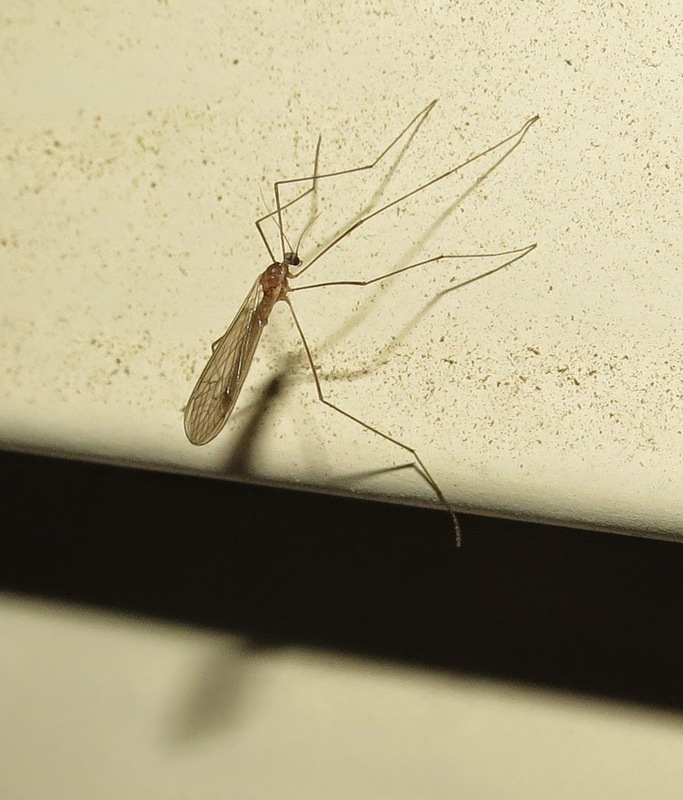 Winter crane fly maggots have been found in decomposing leaves and vegetables, as well as in fungi, manure, decaying tubers in root cellars, and in rodent burrows where they probably scavenge on feces. Most North American trichocerids are in the genus Trichocera, which accounts for 27 species. There is one species each in the genera Paracladura (western North America) and Diazosma (transcontinental). Since these flies are of no economic importance, we don't know as much about them as we do other insects. Still, I find it delightful that I can find a flying insect in the dead of winter. It is a testament to the durability and diversity of insect life no matter the weather or the environment. Sources: Clark, Patterson. 2011. 'Snow Swarms: Winter Crane Flies," The Washington Post. 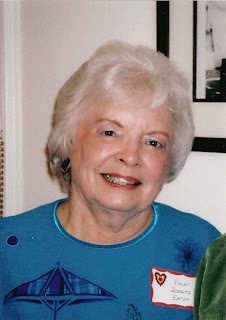 Fetzner, James W., Jr. 2007. 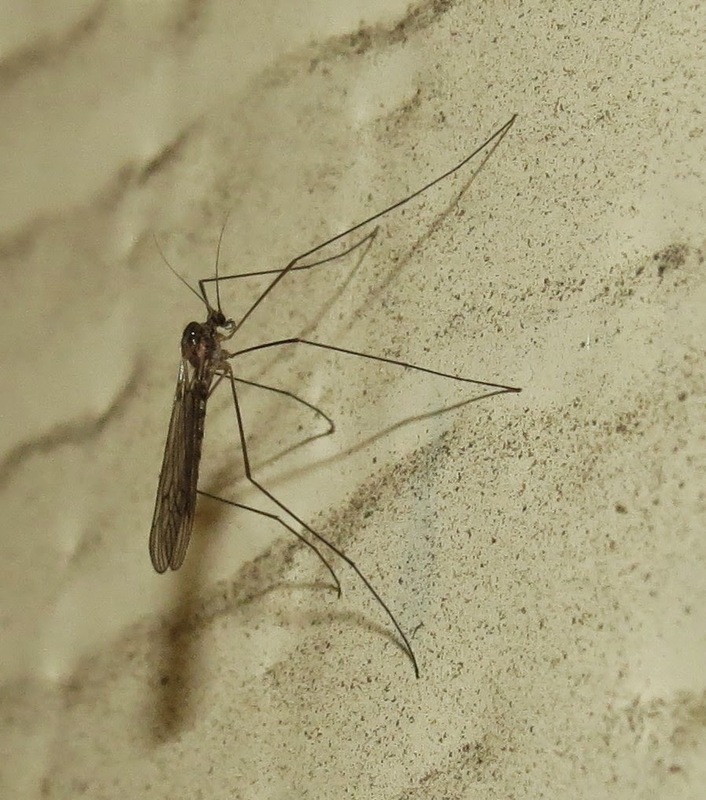 "Trichoceridae," The Crane Flies of Pennsylvania. Carnegie Museum of Natural History. Leckie, Seabrooke. 2010. 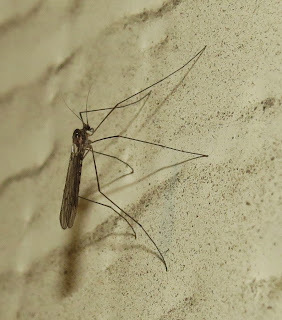 "Tay Meadows Tidbit - Winter Crane Fly." McAlpine, J.F., et al. 1981. Manual of Nearctic Diptera, vol.1. Ottawa: Agriculture Canada. Monograph No. 27. 674 pp. 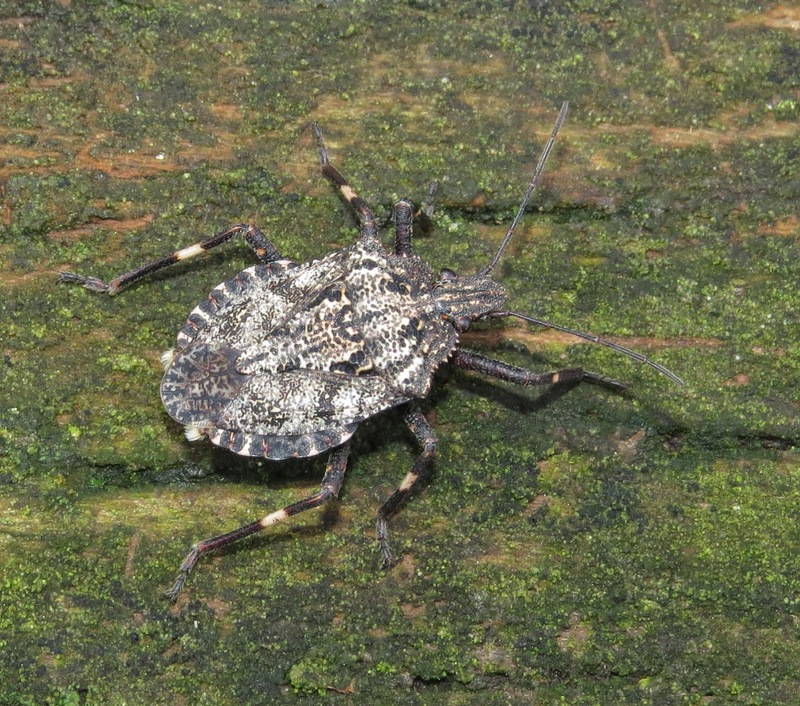 Rough stink bugs in the genus Brochymena, native to North America, have suffered ever since the arrival of the invasive Brown Marmorated Stink Bug from Eurasia. The two are easily confused at first glance, but if you find large numbers of stink bugs in or around your residence, chances are it is the invader, not our natives. Brochymena also overwinters in the adult stage, but usually stays outdoors, tucking itself under loose bark with other members of its kind, or finding some other snug place where conflict with people is minimal. Last month I had occasion to go to Portland, Oregon, where I encountered the specimen shown above. 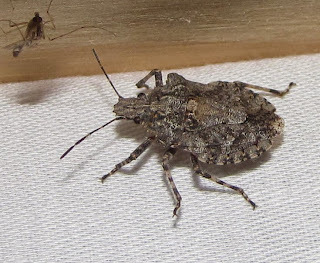 It is likely Brochymena affinis, but identifying rough stink bugs to species is difficult if not impossible without scrutinizing the (dead) creature under a microscope. Many times you will find Brochymena out and about on warm, sunny winter days. That does not mean they are easy to spot, however. They resemble both in appearance and texture the lichen-mottled bark on trees. Indeed, their other common name is "tree stink bugs." Adults fly well, and may alight on fences, the sidewalk, or some other similar, contrasting backdrop, and it is then that one usually recognizes them as animate objects. Depending on which authority you consult, there are somewhere between 21 and 23 species of Brochymena found in North America north of Mexico. Adults of our species collectively range from 10-19 millimeters in body length, and are an overall gray color with black and white or ivory speckling. 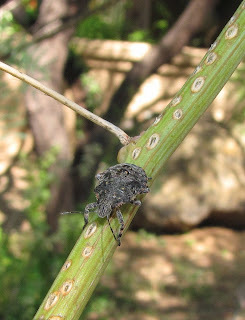 Eggs are laid in small clusters on twigs of trees, and the nymphs that hatch progress through four instars (an instar is the interval between molts) before reaching adulthood. Their development from egg to adult is surprisingly long, so there is but one generation produced annually, at least in temperate climates. Their ability to withstand cold became abundantly clear to me when I was still collecting and preserving specimens. 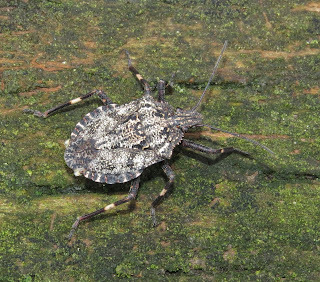 When I was in Cincinnati I discovered an aggregation of rough stink bugs beneath a shard of bark on a tree. I attempted to kill some of them by placing them in a container inside my freezer. I think I left them there about a week or so, took them out, and found them coming back to life in short order. Rough stink bugs are not pests in any way, shape, or form, so consequently rather little is known about these insects of non-economic importance. They are suspected of feeding on the sap of host trees and shrubs, though there are persistent rumors that they are occasionally predatory. 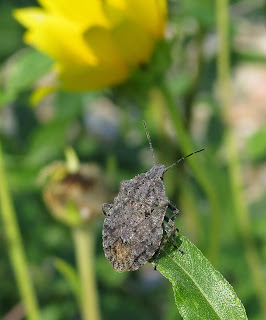 Since many true bugs (Hemiptera: Heteroptera) are opportunistic predators or scavengers on other insects, this may not be a stretch. 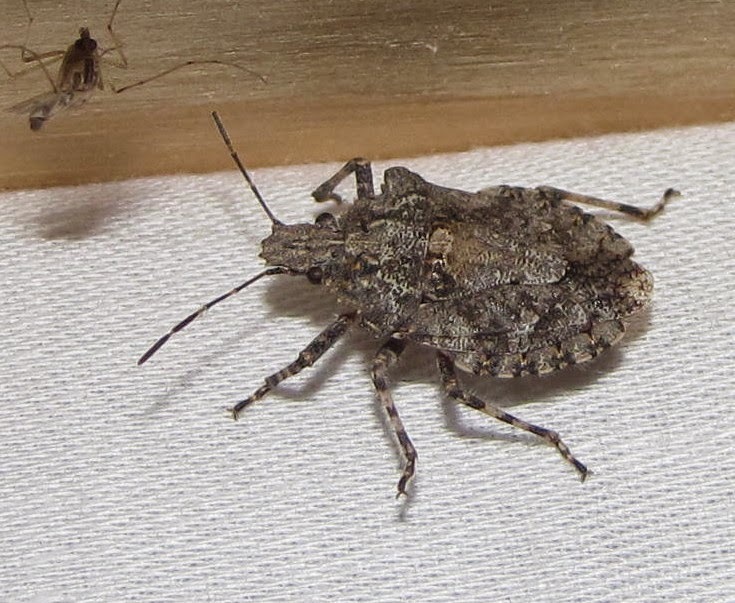 So, how does one tell a harmless Brochymena from a pestiferous Brown Marmorated Stink Bug (BMSB)? First, look at the antennae. The BMSB has white bands on the last two antennal segments. 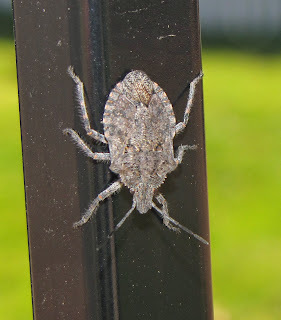 Rough stink bugs have no such contrasting markings on the antennae. Second, look at the leading edge of the pronotum (top surface of thorax), right behind the head. There are fine teeth along that edge in Brochymena, not so in the BMSB. Given their cryptic nature, it amazes me that any other creature could find them and make a meal out of them, but enemies they do have. 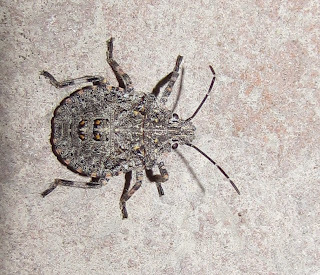 Rough stink bugs are known to be the prey of the sand wasp Bicyrtes quadrifasciata, for example. The female wasp finds a stink bug, stings it into paralysis, and then flies it back to her nest burrow where she deposits it as food for her larval offspring. Birds, and fence lizards are also recorded as predators of the adult bugs. Feather-legged tachinid flies in the genus Trichopoda glue their eggs to the top of a stink bug's body where the insect cannot reach to groom them off. The fly larva that hatches bores through the exoskeleton of the host and feeds as an internal parasite, usually killing the bug eventually. The eggs of Brochymena are also parasitized by the tiny platygastrid wasps Trissolcus brochymenae and Telenomus sp. ; and the eupelmid wasp Anastatus reduvii. 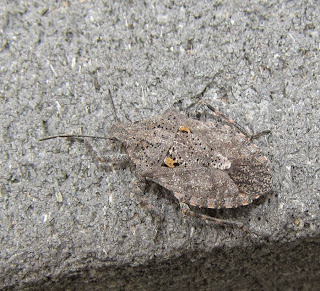 Look for rough stink bugs in spring and fall when they are emerging from, and entering, hibernation. You'll have to look closely, though, given their camouflage. Sources: Cuda, J.P. and J.E. McPherson. 1976. 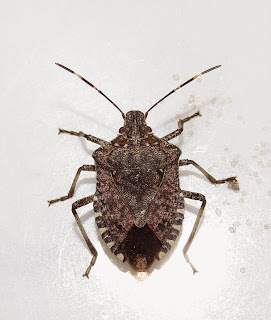 "Life History and Laboratory Rearing of Brochymena quadripustulata with Descriptions of Immature Stages and Additional Notes on Brochymena arborea (Hemiptera: Pentatomidae)," Ann. Ent. Soc. Amer. 69(5): 977-983. 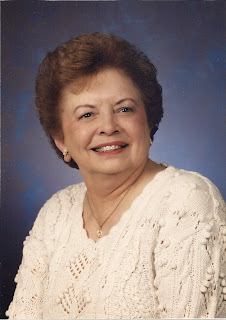 McPherson, J.E. 1982. 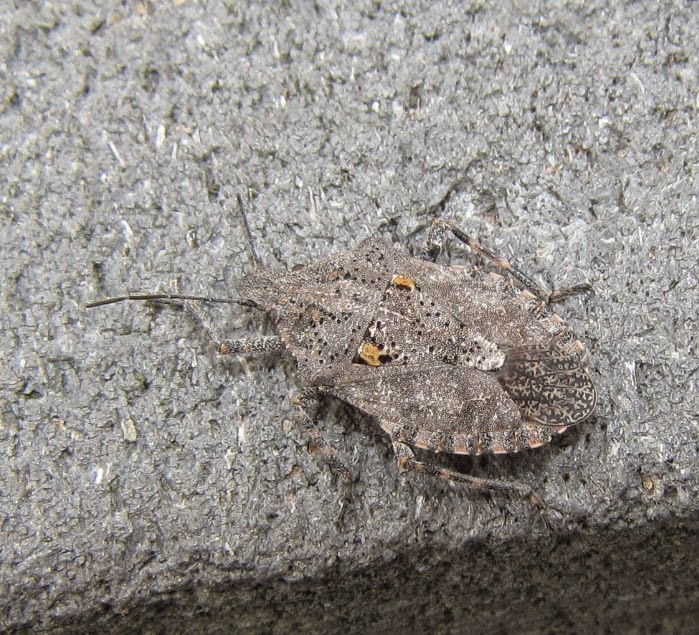 The Pentatomoidea (Hemiptera) of Northeastern North America with emphasis on the fauna of Illinois. Carbondale: Southern Illinois University Press. 240 pp. Sutherland, Carol, and C. Scott Bundy. 2012. 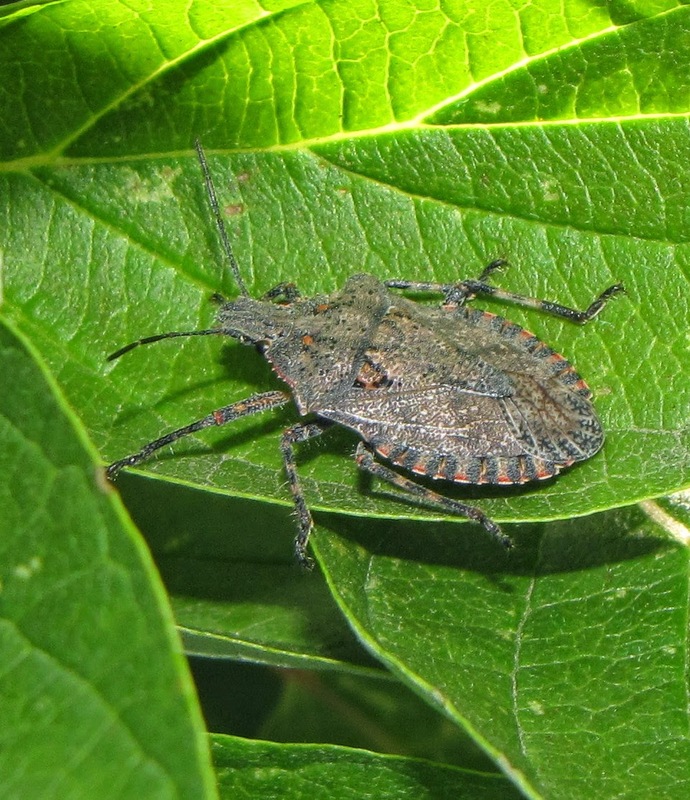 "Real Stinkers in Pecan Production: Stink Bugs, New & Old (plus Leaf-footed Plant Bugs)," Proceedings of the 46th Annual Conference of the Western Pecan Growers Association, pp. 44-55. 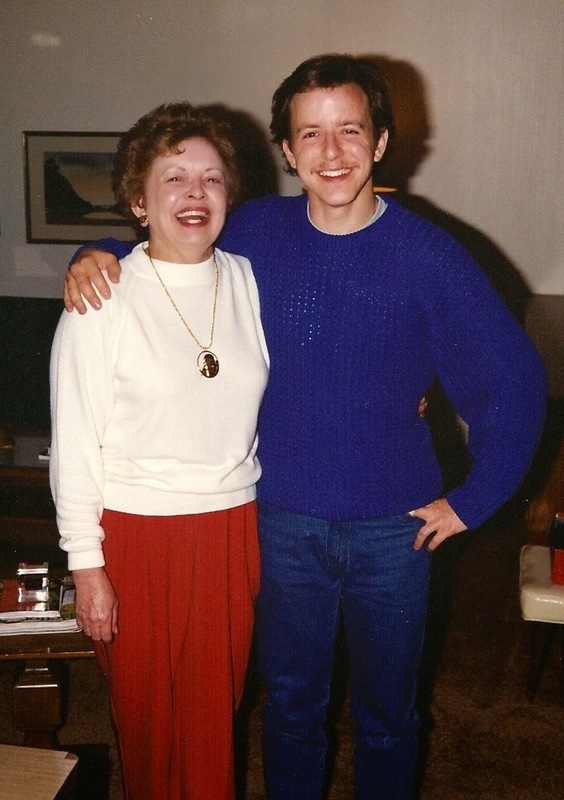 My recent trip out to Oregon to look in on my mother, Violet Eaton, turned out to be my last time with her. She passed away on December 9, 2014. Going through her belongings in the aftermath reminded me that I owe her a great deal for her support of my interests in entomology, and nature in general, during my childhood. Mom did not have a very good childhood herself, having gone through the foster care system, eventually coming to live with the woman I knew as "grandma" growing up. My mother also survived tuberculosis (twice, in 1949 and 1962), divorces from my father and stepfather, and raising me pretty much single-handedly. Back then there were few, if any, resources for single mothers, and returning to the workforce relatively late in life was a real challenge. She even kicked her smoking habit in the 1990s. 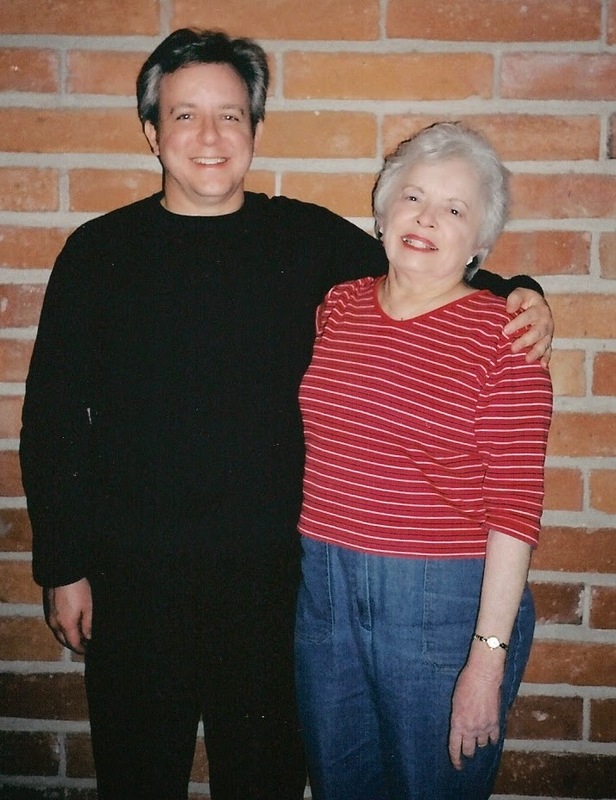 Mom was extraordinarily resourceful, and how she found professional mentors for me in an age without electronic resources is beyond me. I remember that a doctor friend of hers knew an allergist who specialized in allergies to insects and was a member of the Oregon Entomological Society. We eventually got introduced and Dr. Perlman took me to a number of meetings of the OES starting when I was about twelve years of age. The OES members quickly took me under their wings, even making sure to clarify various concepts and insect body parts during lectures at the meetings; and they helped me identify specimens in my collection when there were few reference books for Pacific Northwest fauna. Meanwhile, back home, mom was helping me capture specimens. She was fond of telling people "If anyone would have told me I'd be standing on a stepstool looking like the Statue of Liberty while catching a spider on the ceiling, I would have told them they were crazy." Mom, I think it was a Scotophaeus blackwalli "mouse spider." She fetched silverfish off the ceiling, too. By the time I got to high school I was being encouraged by my biology teacher, Karen Wallace, to continue pursuing my entomology hobby. I was also in the Boy Scouts, but found the troop organization reminded me too much of the military, so I quit. My sophomore year, we heard that there was an environmental science Explorer Post (ironically, still party of the Boy Scouts) forming at a nearby state park. I had finally found my people. The post was coed, too, which didn't hurt any, and included students from several Portland high schools. Our advisor, Dave Simpson, was the park naturalist, and he did a wonderful job of balancing projects like trail maintenance with field trips, invited speakers at our meetings, and other fun activities. Dave is now retired and living in Salem, Oregon, but he made a point of driving up to visit me while I was in Portland, on New Year's Eve day, no less. We had lunch together and he related that my mom was the only parent who reached out to him to learn more about both the Explorer Post and Dave himself. I guess he passed muster because I was in the post for three years. 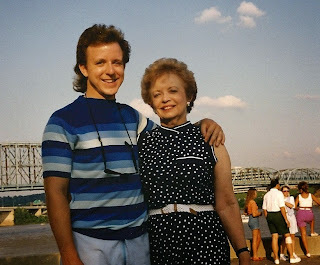 Mom made sure I got into college, too, helping me apply for scholarships. I even received one through Gaylord Broadcasting Company, her employer at the time (KYTE radio in Portland). Once I got into Oregon State University, I continued my involvement with the Oregon Entomological Society and was elected president my sophomore year. Considering most of the members were grad students or older, I was quite flattered. I never finished my degree, which I think was something of a disappointment to my mom. I know that she was proud of me for what I did achieve, despite my lack of academic credentials, and I hope to do her proud the remainder of my life. Mom is a real inspiration for her dedication to helping other people through personal relationships and events, organizations, and programs she created. She co-founded the Conchords Chorale in 1982, and they are still singing today, performing at various venues, especially around the holidays. Mom also created "Rebound," a series of free monthly classes for those age 50 or over who were unemployed or underemployed. That program ran from 1979-1982 at the Hillsdale library branch in southwest Portland. She even produced a music appreciation class for Portland Community College in 2000. My mother was probably best known for organizing reunions and "hen parties" for her Grant High School class of 1946. Many of those who attended her celebration of life gathering on January 8 were indeed high school classmates. 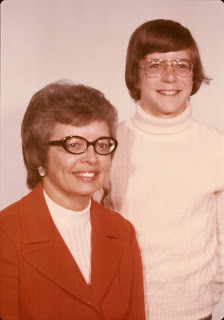 Although she never really took to the digital age, mom always sent greeting cards for birthdays, anniversaries, and other special occasions. She clipped articles, inspirational quotes, and poems out of newspapers and magazines and sent them to friends and family all over the world. She also enjoyed long telephone conversations, and especially in-person meetings over lunch or dinner.